Minimum quantity is 6 t-shirts or garments per design. Normal production time is 9 business days from receipt of final art approval. Rush delivery time is 6 business days (add 25%). Hot rush delivery time is 3 business days (add 50%). Art files must be in vector format with fonts outlined and saved in .ai, .eps, .pdf, or .psd files. Photoshop files must be saved at 300 dpi with layers not flattened. .eps and .wmf vector files are available at www.yourartpages.com, email item# and we'll download for you. Extra set-up for flash print layer sometimes required for light colored inks on dark shirts for best quality print. 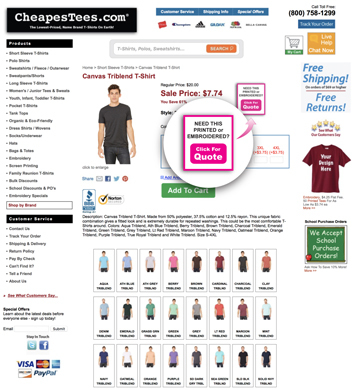 Order blank t-shirts on-line, and in comment section write "Custom Order". Then send artwork to artwork@cheapestees.com. In body of email, include instructions on location(s) of printing, ink color(s), and preferred size of image. We'll send you a proof for approval and adjust the price of the shirts to reflect printing costs. Nothing is charged until we receive your approval. For information and prices on Embroidery, see our Embroidery page. *By placing an order with Cheapestees.com you acknowledge that you are the owner of, or have the necessary authorization to use, the submitted artwork and that the submitted artwork does not infringe any rights of any third party. You also acknowledge that you will indemnify, defend and hold harmless CheapesTees.com in connection with any action, claim or costs regarding the submitted artwork by a third party. Screen Printing & Embroidery Embroidery, $4.25 Flat Fee. More >> School Purchase Orders We Accept School Purchase Orders.